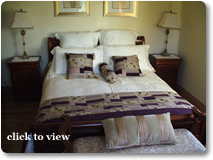 The rooms at Chestnut Haven B&B are tastefully decorated with quality furnishings and linen. All the rooms enjoy ensuite facilities, with toilet, handbasin and shower. A hairdryer is also provided. To ensure your stay is as comfortable and relaxing as possible, each room also has a remote control television. Coffee or tea is available on arrival. The breakfast menu includes a range of cereals, juices, breads and, of course, our renowned "full Irish". If our guests' previous comments are anything to go by, we're pretty sure you'll enjoy the food!